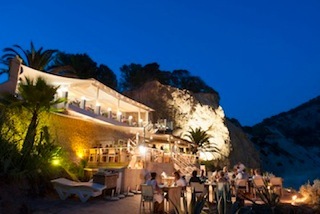 Legendary DJ Jon Sa Trinxa will playing a residency at award-winning Ibizan beach club Amante. One of the stalwarts of the Ibizian Balearic scene, Jon will be playing a weekly chill-out set every Saturday from 8pm – 12pm until September. Amante is one of Ibiza’s true hidden gems of Ibiza, overlooking the natural beauty of the stunning Sol Den Serra Bay on the east coast of the island. Recently voted “Best Beach Restaurant” in the White Ibiza Best of Ibiza 2012 Awards, the definitive guide to the best of the island, Amante has a stunning rural location- the perfect place to recharge your batteries, luxurious day beds, the freshest, innovative food with a real Spanish flavour, great service, unbeatable views, delicious cocktails (try signature Posta del Sol –a blend of vodka, Aperol, fresh pineapple and rosemary, shaken with a touch of rose syrup), a cool contemporary interior and of course a great soundtrack.